Kassandra is an storm surge operational forecast system for the Mediterranean and the Black seas. It consists in a 3D finite element hydrodynamic model (SHYFEM), including a tidal model, in a third generation finite element spectral wave model (WWMII), fully coupled to the hydrodynamic model and using as input surface data (wind and pressure) obtained from a suite of meteorological models provided by ISAC-CNR. The system considers several interactions among wave, surge and tide such as the wave contribution to the total water level by means of wave setup, the influence of tide and surge on the water depth, the depth and current refraction of waves by surge water level and currents. The finite element method permitted to follow the details of bathymetry and morphology in the coastal zone, describing the areas of special interest with higher resolution. The meteorological model chain comprises the global model GFS (resolution of 40 km, six days of forecast), the hydrostatic model BOLAM (resolution of 8.3 km, three days of forecast), covering the Mediterranean and the Black Sea, and the non-hydrostatic model MOLOCH (resolution of 1.25 km, two days of forecast) which covers the Italian peninsula. The numerical simulation system provides daily forecasts, to maximum 4 days each, for the Mediterranean and Black seas at steps of 3 hours for the total water level (tide + surge + wave set-up), surface currents and significant wave height (computed in terms of zero moment of the spectra, which is the volume of the spectra, Hs = 4*sqrt(m0)). This forecast system results from the collaboration between the ISMAR-CNR, IAMC-CNR (Gruppo di Oceanografia Operativa), ISAC-CNR, NCKU (National Cheng Kung University), and Dr. Aaron Roland and Prof. U. Zanke from the Department of Hydraulic Engineering, Darmstadt University of Technology, Germany. The Black Sea forecast system has been developed in collaboration with the Romanian Research and Development Institute for Marine Geology and Geoecology (GEOECOMAR). The Mediterranean Sea and the Black Sea models are decoupled and no informations are exchanged between the two basins. The numerical grid of the hydrodynamic and wave models covers the whole Mediterranean Sea with about 140,000 triangular elements having a resolution that varies from 15-20 km in the open sea, to 5 km in coastal areas and to 1.0 km along the Italian coast. The water column has been discretized into 16 vertical layers with variable thickness ranging from 2 m, in the topmost 10 m, to 500 m for the deepest layer of the outer shelf. Tidal signal derived from the FES2004 global model has been imposed at Gibraltar Strait. The model considers 4 semi-diurnal (M2, S2, N2, K2), 4 diurnal (K1, O1, P1, Q1) and 3 long term (Mf, Mm, Ssa) tidal components. Baroclinic terms, rivers discharge and heat fluxes are not considered in these simulations. No data assimilation is performed in the forecasting system. In this section preliminary hindcast results are presented. In the next future the forecast results performance analysis will be carried out. 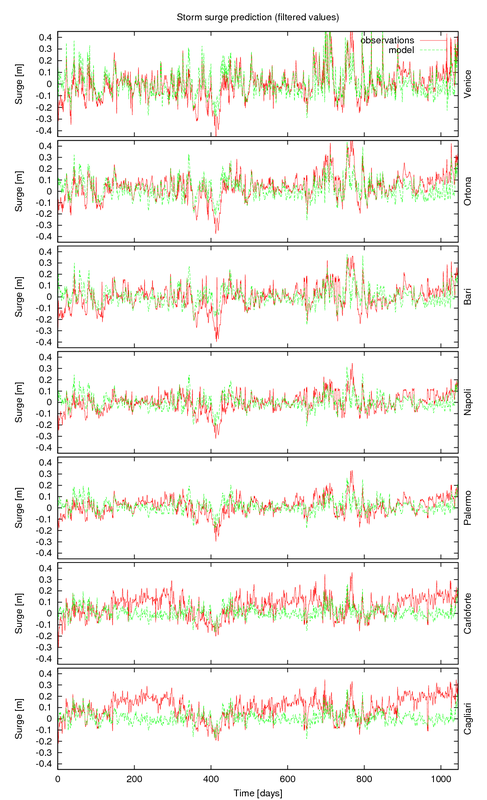 Model performance has been evaluated comparing the simulated water level and wave characteristics against observation database along Italy (RMN & RON). ECMWF wind and pressure forcing data has been used in this 3-year long simulation. Tidal harmonic analysis has been performed on both modelled and observed water level in order to validate the model for both the tidal and the storm signals. Analysis results are given in terms of RMSE (root mean square error, in cm), BIAS (difference between mean of the observations and simulations in cm), for the tidal components and in terms of RMSE (in cm), BIAS (in cm), R2 (correlation coefficient) and SI (scatter Index) for the residual water level and for the significant wave height. Statistical analysis has been carried out on the principal 4 diurnal and 4 semi-diurnal components. RMSE is, for all analyzed components, below 1 cm for the tidal amplitude. The numerical grid of the hydrodynamic and wave models covers the whole Black Sea with about 21,000 triangular elements having a resolution that varies from 40 km in the open sea to less than 0.5 km along the Romanian coast. The water column has been discretized into 27 vertical layers with variable thickness ranging from 2 m, in the topmost 20 m, to 500 m for the deepest layer of the outer shelf. The Black Sea models are forced by the BOLAM meteorological model for the first 3 days of forecast and by the GFS global model for the last day of forecast. The model considers 4 semi-diurnal (M2, S2, N2, K2), 4 diurnal (K1, O1, P1, Q1) and 3 long term (Mf, Mm, Ssa) tidal components. The Danube, the Dnestr, the Dnepr and the South Bug rivers are considered in the simulation with constant average values. Baroclinic terms and heat fluxes are not considered in these simulations. 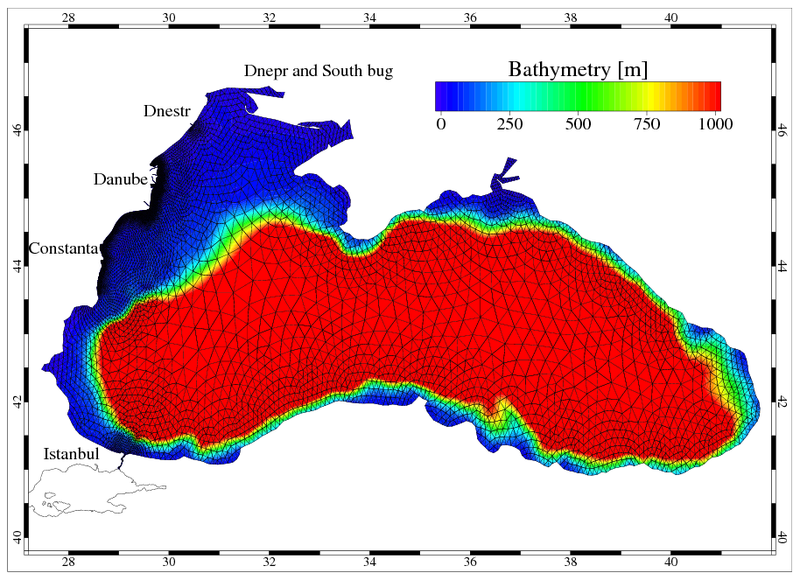 Bathymetry data of the Black Sea were initially provided through the project CLASS - 32130/2008, funded by the Romanian National Authority of Scientific Research. Ferrarin C., Roland A., Bajo M., Umgiesser G., Cucco A., Davolio S., Buzzi A., Malguzzi P., Drofa O., 2013. 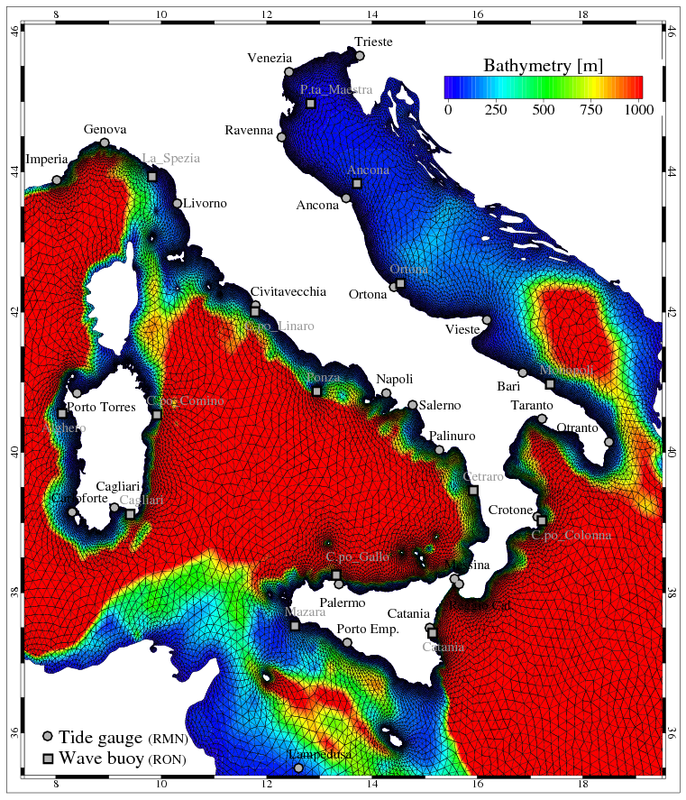 Tide-surge-wave modelling and forecasting in the Mediterranean Sea with focus on the Italian coast. Ocean Modelling, Vol. 61, 38-48, doi: 10.5194/asr-6-227-2011. Bajo M., C. Ferrarin, I. Dinu, G. Umgiesser, A. Stanica, 2014. The water circulation near the Danube Delta and the Romanian coast modelled with finite elements, Continental Shelf Research, 78, 62-74, doi:10.1016/j.csr.2014.02.006. Roland A., Cucco A., Ferrarin C., Hsu T-W., Liau, J.-M,. Ou S.-H., Umgiesser G., and Zanke U., 2009. On the development and verification of a 2-D coupled wave-current model on unstructured meshes. Journal of Marine Systems, Vol. 78 (Suppl. 1), 244-254, doi:10.1016/j.jmarsys.2009.01.026. Bajo M. and Umgiesser G., 2010. 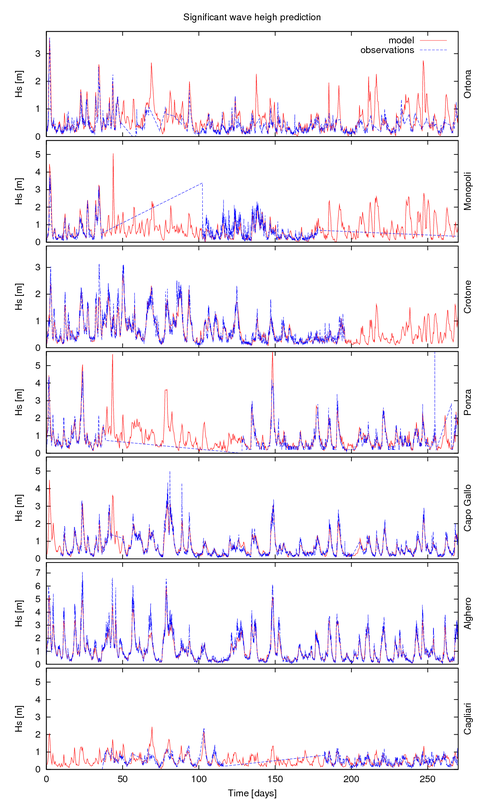 Storm surge forecast through a combination of dynamic and neural network methods. Ocean Modelling, Vol. 33 (1-2), 1-9, doi:10.1016/j.ocemod.2009.12.007. Ferrarin C., Umgiesser G., Cucco A., Hsu T.-W., Roland A. and Amos C. L., 2008. Development and validation of a finite element morphological model for shallow water basins. Coastal Engineering, Vol. 55, 716-731, doi:10.1016/j.coastaleng.2008.02.016.